If you’d like to enjoy a number of money-saving benefits, why not become a Sarawat Rewards Customer today? It’s free to join, and the points you earn can be spent on your next purchase or keep the points to use them later when needed. You will also be entitled to exclusive access to special discounts for rewards card members only. Visit the Customer Service counter to sign up before you shop or register at the till with your mobile number to start earning points instantly. Register online with your smart phone by making use of Sarawat’s free WiFi zone at the store entrance before any points can be redeemed. At Sarawat, we’re always trying to find new ways to help you save money. That’s why we not only give you points every time you shop, but add some bonus points too. Look out for the in-store promotions on selected items to double your points and exclusive specials for rewards card members only. Just give your rewards card to the cashier at the till before you start putting your purchases through and he will do the rest. You will receive 1 point for every SAR 1 you spend. 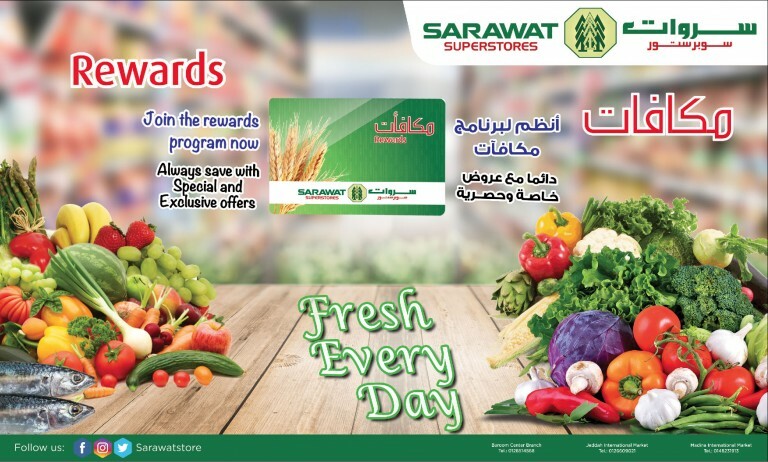 Points can be redeemed at any Sarawat Supermarket. You will be able to redeem your points on your next purchase as soon as 1000 points was accumulated on your card. Once you have reached 1000 points visit the in-store Customer Service counter to exchange your points for Sarawat Shopping vouchers. This voucher can be used to receive a cash back discount on your shopping during your next purchase. Remember, you will be able to redeem a 1000 accumulated points for SAR 15 on your next purchase at a Sarawat Supermarket. It is important to remember that your ID or Iqamah is needed to identify yourself during the redemption of points. Can I receive discounts without my card? Unfortunately, no card, no points. We can’t award points afterwards, so in order to earn your points, always give your rewards card to the cashier to swipe as you shop. Sarawat reserves the right to alter or change operational conditions of the rewards card program or to terminate it at any point. In the event of program termination, points will remain valid for 30 days. Cash rewards held on the customer account will not be affected. You are required to submit your valid identity to register, and to redeem your points, to change your details or manage your card. By providing Sarawat with your personal information, you give Sarawat permission to send you information regarding its promotions via SMS, MMS or email. Your card will automatically be terminated if not used for a 3 month period. Rewards points earned will be added to your account as soon as the new purchase is done. No reward points will be earned on discounted items purchased.